Please, continue here while I snore in my lair. A depressing first post: looking at GW straight on, what are the consequences? I've read the various projections of various effects. But I don't understand, when does it stop? All the forecasts have been wrong so far. Do temperatures keep going up.. and up... and up? Are we all dead? The news from Antarctica is almost 'no news', melt looks bang on average. IIRC Hudson bay froze up very late last year as well. My addled brain says it only started freezing last week of November first week of Dec.
Also dont know if anyone else noticed there was a brief spike in temperatures on the mid troposphere of UAH in early November, back up to near recrod, although it is now back down to average for the AMSU on AQUA, touch and go to see if we beat 98 still on that one still. Anyone who is Uk based - and concerned about climate, it's only a small amount but if we can't change the small things , what hope for the bigger. There is a bill in parliament a week Friday 3rd December proposing a cost frree change to our clocks that would mean lighter evenings and .5M tonnes less CO2 emmissions (and 100 livs saved on the roads). The campaign urgently needs UK residents to write to their MP's to ask them to support it. There is a very easy to use tool to do this http://www.lighterlater.org/mp/write and lots more info on http://www.lighterlater.org. If you agree please pass round all your networks. A 2010 post-season pan-arctic summary is now available. "Numerical experiments are conducted to project arctic sea ice responses to varying levels of future anthropogenic warming and climate variability over 2010-2050. A summer ice-free Arctic Ocean is likely by the mid-2040s if arctic surface air temperature (SAT) increases 4°C by 2050 and climate variability is similar to the past relatively warm two decades. If such a SAT increase is reduced by one-half or if a future Arctic experiences a range of SAT fluctuation similar to the past five decades, a summer ice-free Arctic Ocean would be unlikely before 2050. If SAT increases 4°C by 2050, summer ice volume decreases to very low levels (10-37% of the 1978-2009 summer mean) as early as 2025 and remains low in the following years, while summer ice extent continues to fluctuate annually." >"But I don't understand, when does it stop? All the forecasts have been wrong so far. Do temperatures keep going up.. and up... and up? Are we all dead?" >"All the forecasts have been wrong so far." Huh? Changes in temperature projections since then have been very minor if comparing like to like with scenarios. >"Do temperatures keep going up.. and up... and up?" With a linear increase in ghg levels then at least to first order you would expect a log relationship - temp trends get less severe as levels get higher (with some noise). With exponential rises in ghg levels then you would expect linear increase in temperature but fossil fuels will suffer peak production issues so that is unlikely in the long term. In the long term we are all dead anyway. Stern estimated something like a 5% cost to world GDP and cheaper if we do something about it. So this is hardly an 'OMG we are all going to die'. It is a shame the debate is so polarised into 'OMG we are all going to die' or 'OMG that is going to totally wreck the economy'. In response to the first commenter; GW is likely going to be a factor in our climate for a very long time (thousands of years). The world is going to become significantly warmer, less ice, higher sea levels and greater storminess. However, it's going to happen very gradually. Not sure what you mean by all the forecast being wrong. Unfortunately, there are a lot of people creating strawmen in an attempt to discredit the science. The only forecast that I've seen are projections for the year 2100 with a recognition that there is a wide spread among the various models. Temperatures will continue to rise until several things happen. First, CO2 levels must stabilize and there is nothing to suggest that's going to happen any time soon. Carbon based fuels are simply too cheap to ignore. Second, ice sheets must stabilize. However, that won't happen until at least several centuries after CO2 levels stabilize. Lastly, vegetation levels must reach equilibrium with the new climate. This will also take hundreds of years. All those tundra areas of the arctic will have to potential to support new forest. There will eventually be entirely new climate zones. Think rain forest near the arctic with lush vegetation in darkness half the year. And yes, of course we will all be long dead by then, but from things that have nothing to do with the climate. Hi, first poster here to clarify my remarks. I am a bloody amateur as the English would say. I follow hurricanes having lived througha couple which led via wunderground to the GW debate. I don't have time to follow the models so, though I understand the very broad concepts of the GW theory, I'd be rather foolish to try to make temperature prediction. *The models have been wrong. >> Since i have been following this, roughly 10 years but much less in the beginning, the predictions have changed. Going totally from subjective memory, the models started with a .5 meter rise in sealevel in 100 years and 'the arctic will eventually be ice free.' Now it appears that the arctic has lost 70-80% percent of volume in the last 20 years and the arctic could be ice free within 3 years. *The models have been wrong II >> CO2 is increasing at x rate. Ok, not so far off. Now though: Hydrates and trapped methane are being released at Y rate, where Y seems to be a rising percent each year with feedback. Damping effects? Effectively None >> 1) Vegetation in the arctic? After the greenland ice sheet melts, maybe vegetation will grow. How much GHG will the vegetation consume in relationship to the CH4, CO2? Little, frankly. During the same time, how much jungle, etc is lost to tropic heating? 2) Sea absorption? Unknown (by me): more warm seas versus sea heating and less absorption capability. In short, the feedback mechanisms that allow the earth to re-absorb GHG and regulate itself are not fast enough or strong enough to deal with a death spiral of releasing stored gas, etc all at once. My question was this: assume that all the methane is released, the CO2 levels double or whatever they will do, what do the models tell us about atmospheric temperatures and the distribution patterns on earth? Will the mean temperature rise by 2, 5, 10, or 40 degrees C? Will the habitable section of the earth shrink to within 20 degrees of the poles? And finally, yes I understand that I may be dead by then. So what? Those sorts of responses are a bit below the standard of what so far has been an excellent site. I'm still hoping that the worst case scenarios don't play out, either because they weren't plausible to begin with (though we can't be sure at the moment), or because we do something about it (I don't think we will, but you never know), or because something happens (some form of collapse of the globalised market due to a combination of strains on the system). >"Those sorts of responses are a bit below the standard of what so far has been an excellent site." You are probably not going to like this answer either. Could this possibly be the fault of the question? Your question was the first to mention 'all dead' and '**all** the forecasts have been wrong'. If it isn't the fault of the question, could it be that the answers you are getting are not matching what you think the answers should be. In which case confirmation bias seems to be a bit of a problem. Yes, sea level rise forcasts have certainly changed but that isn't **all** forecasts. Global average temperature forecasts for a given scenario are staying very similar from as long ago as 1988. This is no surprise - models are good at some things and not good at others. Global average temperature is one where models are good. Yes there are many things they are not good at and different forecasts are therefore likely. >"My question was this: assume that all the methane is released"
Sorry but all from permafrost or methane hydrates close to being unstable under shallow cold water or all methane hydrate and what timeframe? 100 years might be a sensible suggestion for these slow release sources. Typical lifetime of methane is around 10 years but this size of methane release would considerably lengthen the lifetime of methane with the sinks being overwhelmed. Anyway the timeframe matters. I don't think we have much chance of keeping CO2 down to 450ppm so a doubling of CO2 from preindustrial 280 to 560 shows you the ballpark without methane burbs etc. Climate sensitivity is equilibrium response to CO2 doubling and this is likely to be near 3C. Though lots of researchers think Annan and Hargreaves are too confident that there isn't a small chance of sensitivity being 5C or more. If it is a 3C rise and this destablises enough methane to double the ghg forcing again (unlikely I would hope/suggest) then you would get to 6C. 6C would be enough to ensure that Greenland and West Antarctica would eventually melt and more methane would be released. This is an extreme possibility and it is hard to see global average temperature rise of more than 10C unless you believe climate sensitivity is more than 4C. Shrink to within 20 degrees of the poles? No. Some shrinkage say to minimum of 60 degrees of poles is just about possible if you take very unlikely possibilities. Note all the above is very extreme because you said "assume that all the methane is released" which is not an assumption I am keen on making. Keeping temperature rises to just 2C above preindustrial is much more likely and the methane releases may well stay at low levels such that sinks are not overwhelmed. Yahoo logs people in that way automatically. For the first time I understand why the denier crowd feels the way they do. Good grief, ask people who seem to do this for a living about the worst case scenario and the patronization starts. Seriously, if you don't develop sensitivity scenarios, how can you understand unfolding situations? How do you ever expect scientists to win a battle with Big Oil if this is the type of response - you may be disgusted by how Big Oil manipulates public opinion with false sceince, but at least they bothered to treat the public seriously enough to ask how to manipulate them instead of sneering down at them from their scientific perches. I think it is a legitimate question and that doesn't make me alarmist, far from it. Nor does it make me defeatist. Ok, enough said, Thanks for the factual part of the responses. I won't pollute your blog anymore. Good work Neven, I enjoyed this very much for a while. Very sorry if I sounded too patronising - I wasn't trying to. Also I am no expert just another bloody amateur. I knew you wouldn't like it but felt it needed saying given the way the conversation seemed to be going. But appologies for the tone. The intended purpose was to try to convey information not sneer. I hate to weigh in on this, but over the past 3 months I have been reading some of the literature, including Heidi Cullen's Weather of the Future, Peter Ward's The Flooded Earth, and James Hansen's Storms of my Grandchildren (the key quote there is something like "if we use up all our present fossil fuel resources (oil, gas, coal) there is a significant chance of a runaway greenhouse gas effect. If we also use up all the oil shale and tar sands, I view [runaway greenhouse gas effect] as almost certain." Put together with some of the research noted on climateprogress.org, these publications by scientists do indeed lay out a possible path to extreme disaster. 2010-2050 (worst-case) Drought affects most of area south of northern Canada, Scandinavia and Siberia. Excessive heat makes low-altitude tropics and south of temperate zone above the equator uneconomic to live in, including parts of US South/Southwest, Mediterranean, Southeast Asia, and Southern China. Rising sea level and increased storm surge effectively makes Miami, New Orleans, Galveston, Boston, south New York City, most of Holland, and almost all of Bangladesh uninhabitable. Flash-flood amount and hurricane-force increases make effective home insurance in all areas skyrocket. More than 500 million people move, and perhaps 5 million die as a result of all of the above. Severe drought affects most of area south of northern Canada, Scandinavia, and Siberia. Oceanic dead zones make Caribbean, Pacific islands effectively uninhabitable, and reduce availability of fish drastically as food source. Drying of major rivers from reduced snow/ice and drought, and/or loss of estuaries from rising sea levels, especially the Amazon, Ganges, Nile, Mississippi, Indus, Yellow. Rising sea level to about 25-50 feet of increase makes most of Florida, much of New York City, Long Island, Cape Cod, Washington, DC, London, Los Angeles, Seattle, Denmark, Tokyo, parts of Chinese coast, Alexandria, parts of Australia uninhabitable. Melting of permafrost and 20 degrees rise in temperature make northern Canada and Alaska, Siberia, and parts of Greenland habitable but difficult to travel in. 30% of ocean species and 30% of land ecosystems become extinct, beginning to reduce available food. More than 1.5 billion people move, and perhaps 100 million people die as a result. Total increases in global average temperature reach 20 degrees F, making many areas in southern US, India, northern Africa, northern Australia, the north coast of South America, effectively uninhabitable. Sea level rise to about 120 feet makes most of east/west/south coast of US, Mediterranean and Atlantic European coasts, most coasts of England, parts of Brazil and India, the coasts of China and Japan uninhabitable – involving the present residence of perhaps 2 billion people. More than 1 billion people move, and perhaps fifty million die as a result. 70% of all species become extinct as oceanic dead zones spread and remainder of land ecosystems that cannot migrate north/south vanish. Increasing downward shocks to the global economy due to reduced availability of fossil fuels (because of less international trade) and decreases/movements in arable land lead to massive famines and inability to cope with famines, which in turn lead to the death of 1 billion. Total increases in global average temperature reach 25-30 degrees, making most of existing tropical zone and much of existing temperate zone either unlivable or uneconomic to live in. Sea level rise reaches its maximum at 240 feet; almost the entire Earth is ice-free. Further migration from coasts, including Black Sea and Canadian and Siberian Arctic. Few humans in Australia, northern 2/3 of Africa, Middle East, most of India, Southern and western China, Southeast Asia, almost all of US, northern coasts of Latin America, Mediterranean, area of Black Sea. Oceanic dead zones continue to spread, beginning to endanger Arctic fisheries. Loss of additional arable land and beginnings of decreased productivity from the remaining arable land due to over-production, leading to additional famines and the death of another 1 billion. Addition of low-oxygen water to oceans creates new bacteria whose huge release of hydrogen sulfide poisons residents of seacoasts and breaks down ozone layer, leading to an additional 20% species extinction and 1 billion more human deaths (Medea hypothesis, Ward, as evidenced by some geologic data). Human burning of all fossil fuels, including tar sands and oil shale, makes carbon in atmosphere reach a “tipping point” that triggers runaway greenhouse effect that cannot be stopped (James Hansen, “Storms of my Grandchildren”). Oceans become so acid that in most areas they cannot support life. Eventually, land temperatures become hot enough to prevent most vegetation from growing, and carbon cannot be sequestered, since the ocean will not create limestone; so it stays in the atmosphere. Massive methane and carbon releases from permafrost drive carbon in the atmosphere, and therefore the temperature, far higher (note: this may occur in stage 4). Somewhere after this point, the oceans will boil, the atmosphere will become unbreathable (primarily carbon), and most life on earth will become extinct – including humans. Extremely high surface temperatures will eliminate the rest of life on Earth, leaving a planet much like Venus. Please note: as we have been for the last 30 years, under "business as usual" we are now on a path to 1100 ppm carbon in the atmosphere by the end of this century, which would effectively take us almost to the start of Stage 4. Also, geo-engineering may save us from stages 4 and 5; but so far, it is not clear how. Naive question for dorlomin: "bang on" -- are you talking about extent? It appears from NSIDC that antarctic melt is skewed from normal, as if circumpolar currents are able to rotate the ice more than usual. This could be explained if sea ice is more fragmented than usual (i.e., less area than usual), allowing the current to push the edges of the ice farther, before and after the peninsula. This, in turn, would mean than more ice is "spun" off into lower latitudes, increasing the amount that melts during the summer season. Wayne, I slightly disagree with some claims in your 1st post. But please, don't get me wrong, I think it was very worth checking the most extreme scenarios. But, I have two objections: 1st, scenarios 4 and 5 are in my opinion very unlikely. (and I have to admit, I haven't checked any calculations, so I may be wrong). And 2nd: I think that prediction of impact on human race and casualties in scenarios 1 and 2 are really, really underestimated, since a lot of people already live in conditions where it is really hard to survive now and extra drought and heat would have more severe impacts on their ability to survive. But anyway, it is just my opinion and it has no real scientistic value, so if anyone has well projected scientific data, I'll be glad to get some more information. Very dire predictions indeed... Why don't we take a step back and think about we know as facts at this stage? 2) Gobal temperatures have increased by 0.7C since the beginning of the industrial revolution and are likely to increase further potentially reaching +2C by the end of the century. It has been established beyond reasonable doubt that anthropogenic carbon gas emissions are the main cause of this global warming. 3) The temperature increase in the polar regions is more significant causing sea ice extent and sea ice volume to retreat significantly. messaging could be more effective for promoting public understanding of climate change research. " In the slipstream of what’s been projected on Open Thread 2 lately, I feel lured to comment on my own feeling on the subject of forecasting the future. First, I like to be honest…my amateur predictions had consequences. But my lovers accepted that gracefully and never failed to embed my naïve amateur opinion in humor. So the nice house near one of the ‘dangerous’ rivers in central Holland was sold. Well in time for a good revenue spurred by the real estate bubble. I never quite understood why the accumulating flood conditions in the latter part of the nineties weren’t continued. In ’99 I took for granted that the flood risk would increase following a linear function. But it didn’t, up to now. Though Poland, Switzerland and Germany have taken some real blows since then (and the Dutch were lucky…). So I changed opinion… climate change events seem to occur in a network pattern. It is never certain where or when we will be confronted with the next blow. But it happens, and the pattern is getting dense in time and space. After the 2003 Larsen B ice shelf collapse I adopted a new preoccupation. The river danger seeming unpredictable, it was sea level challenging us on a cause and effect basis. Foreseeing that mitigation would be late, adaptation should be prepared. I took the +10 m. above present sea level to be reasonably safe. The Dutch should have time and capital enough to prepare housing for more than a million people in a safe spot on the Peel horst. In the mean time, they should be able to safeguard old Amsterdam and the port of Rotterdam for at least fifty years, given that the dune-line on the present North Sea coast could be held. This was all based on my amateur assumption that the south Greenland ice sheet would go first. That would nicely correspond with the predictions made by Rahmstorf et all in 2009. Given BAU conditions, a 50 cm sea level rise in 2050 is not out of the question. Last but not least…I assume people will get to action. But it will not be the loss of summer arctic sea ice by 2012 that is going to trigger that. It just doesn’t really get to the daily concern of the people living far from arctic regions. What is going to do it is a lot of New Orleans disasters. And repeating within short time. When? I wonder what the climate/weather effects of an ice free arctic ocean will be, and say 15 cm of sea level rise within the next ten years. Finally, the Greenland ice sheet seems to have shed more than 500 Gt of ice this year. That is real climate business. When it gets to 1000 Gt and more a year, people are going to notice (2016?). Late, yes, but not too late to letting all hope fade. I agree that some people may take action. A hundred Million people is in my opinion a high estimate for how many may actually take actions that reduces their carbon foot print to a level necessary to limit global warming. However, that leaves at least 6.7 Billion people and counting for who it will be business as usual. Also, global warming is actually making this planet more habitable for humans and will do so for probably another 50 years. So, this will lull many people into generally ignoring anybody that predicts doom and gloom. My impression is that no activist or politician will ever be able to change the economics of carbon combustion. So, CO2 emissions will continue to rise until we run out of carbon based fuels or the human population begins to fall. My hope, is that the former will happen first. The freeze over seems to have plateaued somewhat over the last week. Comparing the Uni Bremen maps for 2010 and 2009 , we can see that the freeze in the Chukski sea is far less advanced than year and hasn't even started in the Bering Sea. On the other hand, the ice has progressed much further North of Svalbard and in the Kara Sea. Has this anything to do with SST or currents? Morning Phil.. esrl.noaa maps showed a nice arctic dipole a couple of days ago. That would clear the Chukchi sea and keep near surface temperature above freezing. At the other side the winds drive out the thin ice, creating high extent between Svalbard and Franz Josef Land. In Baffin-, Hudson Bay and Foxe Basin it could well be accumulated heat leading to an extended ice free season. Dorlomin: Thankyou for following up on those extreme CH4 readings. Indeed that feels a whole lot better, well maybe more correctly ‘felt better momentarily', ‘til I read the posts that followed. Some interesting comments - theories in this thread. What are the Birds and Bee's telling us, what are they doing? Do they listen to or read the pro -v- con positions on a climate warming -v- cooling? What are the Biologists, Botanist, Naturalist finding in their study of Flora 'n' Fauna? Flora 'n' Fauna species with habitat predominately in the temperate zones, the mid-latitudes, are they spreading more toward polar latitudes or are they spreading more toward equatorial latitudes? Vegetation blooming time, dates of last and first frost of the year, are they changing? Remember, it's not nice to try to FOOL Mother Nature with propaganda? The cersat drift map shows a strong drift from the Bering strait to the Fram which is consistent with Phil263 and werther's comments above. Me again and this time the last time for real. Glas Glo, this was the patronization: "I knew you wouldn't like it". Huh? I really can't imagine how what I said could be taken to give the impression that 'I wouldn't like it.' It's like going to a doctor and asking about unusual symptoms and having the doctor treat you like a hypochondriac. Aside from that patronization, factually if this isn't a legitimate concern - I mean that if the changing environment isn't leading to death and destruction (albeit shy of 'we are all dead'), then why should anyone care? Either it is serious enough to care about and hence condescension is ill founded or it is not worth discussing on a blog, let alone in peer reviewed articles. Personally, I actually would love to not care at all and I think I am headed in that direction. If this isn't a 'death spiral' but just politics then I'll go with my life and support and participate in the solutions others devise but I won't worry my pretty head about it. At the risk of piling on, you would be more credible if your quote identifying what Gas Glo wrote that was patronizing was from something he wrote before you leveled the accusation of patronization rather than after. It's hard not to get the impression that you entered the conversation here itching to take offense at responses to your query and not to accept any apologies, one of which Gas Glo offered. you forgot to mention one aspect.that is naturally evolving scientific progress so called god. even hawking hopes to see on its given years a completely free energy production. This morning I left an office after a meeting with the township and I had the same feeling of frustration: someone telling me what I think instead of listening to what I am saying; ie someone trying to put me into a box which they can respond to in a way that makes them feel good/in control. I thought all the way back to the office about whether this was my fault, that this guy really did understand what I wanted to accomplish and I was just not listening to the answers, or was it as i took it, that he wanted me to fit into his preconceptions. However, the conversation took place half in Italian and half in English -both of us are half fluent in the other's language - so it makes it more difficult. In any event it reminded me of this blog so i am responding I will hopefully close out the argument and basta! To Jon Torrance, yes i quoted a post after the original post but in my mind I wasn't bothered by the particular quote but by the emotion it represented. To me, that emotion was a theme through the earlier posts as well and i just chose a latter example. If you want an earlier quote, try this: "You are probably not going to like this answer either." What I find objectionable is being categorized and dismissed, especially in a way where the assumption is that I am looking for some emotional satisfaction rather than a straightforward answer. Why should I like or not like an answer? As to whether this is me imagining it or overreacting... as far as imagining goes: no I don't think so but, maybe. I think the text is clear for if it is not, then I do have a serious problem. As for over-reacting, again I don't think so but less confidently. I think because i liked the blog there is a sting that goes past just annoyance. Perhaps that sting is not justified, but it doesn't seem to be a problem in other areas of my life so maybe it is just that written words weigh heavier than verbal expressions do (both in action and response)? I don't know, I don't have much experience blogging/commenting. In any event, I wasn't searching for a particular answer or posting with a hidden agenda. It was straightforward information. Like most laymen, I am not really sure what to think about global warming. I don't understand the models enough to give full credence to them either way. I find the arguments of the denialist crowd less intelligent and too often argumentative so that fact plus circumstantial physical evidence of shrinking glaciers, coral bleaching, etc., puts me in the believers camp (or alarmists camp if you will). The one fact that I do believe is that arctic ice will disappear in a few years. I don't know what that means. For example, if the sea ice around greenland melts, then it is assumed that ice on land is less insulated as well and so it will be more likely to melt, etc etc (I know there have been some comments with links to this subject.) I understand the general idea but calculating the effect in quantitative terms is beyond me, for the same reason I don't have any faith in the forecasts of others, I have to rely on their ability. Thus I value this blog for having people who seems to care and be knowledgeable about the subject. I really will go back and try to figure out what i said that gave everyone the impression that I wouldn't like any answer different from what i was assumed to be looking for. I don't understand how my words were taken that way and to be honest, I am not even sure what the assumptions were about me. But since several people seem to have that impression, i will make the effort. Hi all, I just wanted to say thanks very much for the thoughtful comments. I don't disagree with any of them, including the criticisms :) One note: I am not sure that scenario 4 is as unlikely as it seems. It requires, apparently, only the complete melting of Greenland and Antarctica ice caps within the next 300 or so years, before negative feedbacks can come into play. Because, according to geological record, the West Antarctic land ice sheet has already collapsed once before in conditions where carbon ppm is no higher than today, and, according to Peter Ward, once that happens the East Antarctic ice sheet must inevitably follow, it seems like a serious danger. Moreover, we are apparently at 390 ppm this year, and still on a track to reach 1100 ppm by the end of the century, with no significant slowing in the trajectory over the last 20-30 years. James Hansen of NASA apparently recently recomputed the "target goal" for carbon ppm from 450 ppm to 350 ppm if we wish to avoid various horrible outcomes, including, I believe, full melting of Greenland and Antarctic ice sheets. Ward also noted some possible geo-engineering ways of avoiding the worst effects of scenario 4, including seeding the oceans with iron (sorry, I'm too ignorant to know how that would help) and "phytoplankton farms". He indicated (from memory) that initial "test runs" did not work. James Hansen noted that one workable geo-engineering method of avoiding scenario 5 was to create "shutters" in space that would basically cast much of the Earth in shadow, preventing the Sun's light from getting through. However, life in the "shadow" would be pretty awful, according to (him or Ken Caldeira?). Dear "me.yahoo", thanks for thinking seriously about these various aspects of the large issue, and about the apparent misunderstanding(s) taking place here. You wrote "maybe it is just that written words weigh heavier than verbal expressions do," and I think (for what it is worth) that that is the main point of difficulty. Written words also lack the information of body language and tone of voice, etc. Online communication generally is notorious for generating emotional responses that were not intended or expected. Wayne, thanks for your precis of some of the very "worst case" scenarios. Was the "tragedy" phase supposed to follow immediately from Phase I? I had difficulty imagining that we could get 25-50 feet of SLR by 2050, to mention one thing that stuck out. On the down side, I think Andrew is probably right that mortality is likely to be higher, faster. We lost something like 70 million people to famine in the 20th century. With severe water shortages, serious energy shortages, and likely a level of military conflict comparable overall to the last century, I'm thinking that mortality will be quite high. In the meantime, it looks that the ice is winning the first innings.. Check this , this and ... this !!! Even my in little "fetish" town of Nome , the sea ice is starting to form .. right on time! Wayne: you asked about "seeding the oceans with iron". This is basically a carbon sequestration scheme. The idea is to stimulate a phytoplankton bloom with finely dispersed iron. After consuming all the iron, the resulting mass die-off and sinking to the bottom of the ocean would effectively sequester the carbon consumed during the bloom. Of course this would create a dead zone in the ocean equal in size to the bloom. There would be a corresponding decrease in the food supply for all animals and man. It also does nothing to solve the Ocean Acidification issue. These are desperate last ditch measures, which can not have any climate effect for at least 30 years. All of which can be avoided with early CO2 reduction. ....which can not have any climate effect for at least 30 years. All of which can be avoided with early CO2 reduction. The signs that we are headed in that direction are not good . With regard to geoengineering, our record on tinkering with natural systems is not good either. Our only hope is that other circumstances such as a collapse of financial systems or peak oil lead to a forced reduction of our economic activity and stop emissions from rising further. If by "winning" you mean "second lowest in the satellite record", then sure. Personally, I think you're setting the bar a little low if mere failure to be the worst in history counts as success. As for the unseasonably cold weather in the UK - sure, it's cold! On the other hand, the heat input from the Sun hasn't changed appreciably, so where has all our heat gone? Answer: it's sitting on the other side of the jet stream meander, warming the Davis Strait and southern Greenland. "Our only hope is that other circumstances such as a collapse of financial systems or peak oil lead to a forced reduction of our economic activity and stop emissions from rising further." It's as if we are up a tree--one precariously teetering on the edge of collapse--and we can't jump. We have to climb down, carefully enough to avoid falling. But time isn't on our side. Peter, my comment above about the "ice winning the first innings . was very much intended to be a "tongue-in-cheek" comment. I realise that one day weather does not give a good reading of the trend. My comment was actually intended as a humorous response to some of the catastrophic predictions posted earlier on this thread! BTW we've just passed the 10 m km^2 SIE mark, but as far as I know Nome is still very much ice free ( see the surf in the background)! We know by definition that past warming of the Earth over geologic time was not caused by man. Instead, Climate forcings vary in a pattern known as Milankovitch cycles. Basically, variations in eccentricity, axial tilt, and precession of the Earth's orbit determine climatic patterns in regular, metronomic cycles of 21,000 years, 41,000 yrs and ~100,000 yrs. Now we also know that, in the past, changes in orbital forcings were responsible for increases in green house gasses, for example thawing tundra off-gasses methane. We can also measure how much CO2 concentration increased due to that warming by using research like the Vostok Ice cores. It's about 100 ppm CO2 difference between the peak and trough of a major cycle. In 2010, we are at a low point of solar insolation due to Milankovitch cycles. Yet our climate has heated up almost 1 C in a geological eye-blink. To wit, 100 years of a 120,000 yr cycle is about 0.083% of a major cycle. The normal temperature swing during a cycle is 10 C total. So we've warmed 10% of a typical cycle in 0.083% of cycle time. This is about 120 x faster than "normal" climate change, and in the opposite direction! We should be cooling slowly right now according to orbital cycles, but instead we are warming (James Hansen has said mankind is responsible for about 120% of currently observed warming). Now what can we say about future CO2 concentrations? We know that warming can cause a further increase of about 100 ppm increase, if warming is gradual. Which would be further bad effects, but perhaps manageable. Imagine 490 ppm CO2 instead of 390, if we rapidly amend our ways. What we don't know, and what becomes the 800 pound gorilla in the front roller coaster car, is the effect of rapid warming on methane release. There is about 1 trillion tons of methane frozen in north soils, which if released slowly, is enough to about double the CO2 concentration of the atmosphere. If instead methane is released in great burbs due to sudden thawing of Northern tundra and shallow sea methane clathrates, then we've got 2 enormous problems. First, if methane is released too fast, we get the 80 x effect on Climate forcings, not the 1 x effect of methane slowly degraded to CO2. Second, large methane releases deplete the level of natural hydroxyl radials in the atmosphere, meaning methane persists longer. Instead of degrading after 100 years, it will continue heating the earth as a super greenhouse gas (the half-life of methane can be predicted based on its concentration in the atmosphere: more methane, slower degradation). Such a methane burp has occurred at least once before in geologic time, at the PETM boundary, about 55.8 Mya. Then, Global temperatures rose by about 6°C and the Arctic ocean warmed, seasonally at least, enough to support tropical lifeforms requiring surface temperatures of over 22°C. So there you have the broad picture of the roller coaster ride we are about to embark upon. We are clunking our way up to the top of the first tall hill, and we can now see the crest from which we will begin our rapid descent. Hold on tight, and don't be surprised if future emergency climate action takes the form of flaring methane, and releasing hydroxyl radicals into the atmosphere in the North. But please, don't think of this as a business opportunity! Hi Gareth. The quote should be attributed to NASA GISS scientist and Real Climate blogger Dr. Gavin Schmidt. I adopt the high end of Gavin's range (120%), because nearly every scientific claim on Climate change over the last 60 years has been an understatement, or has underestimated the size of the effect. Of course, Dr James Hansen is Gavin's boss, and is the lead author of NASA's 2010 GISS Surface Temperature Analysis (GISTEMP). I think Bill Ruddiman's work has focused more on Climate effects over the last 8,000 years. Gavin Schmidt's comments above refer to the temperature record over the last 40 years. Thanks for checking in, Gareth! Natural climate drivers would be expected to cause a very slow cooling; what we are witnessing is warming of about 5 times greater magnitude. Methane levels obviously involves much more than direct human/agriculture releases. Arctic warming and precipitation patterns play a significant role. Recently, Lake Baikal in Russia has been at the centre of some controversy regarding large circles that have appeared on the Ice in late Spring. They have now traced to methane release. This is 3,000 km from the E. Siberian Sea, with maybe 1 M km^2 of thawing permafrost in between. You guys want to have a laugh? Check out the colour-blind meteorologist. 2. assume the data is cooked? If you picked option 2, Accuweather may have a job for you. Just a small flock like this, busily feeding up & down the beach. Magic! Satellite tracking shows they fly to NZ nonstop! Thousands of them. I find migratory birds fascinating. The arctic tern flies all the way from antarctica to the Arctic (a round trip of 44,000 miles at an average speed of 18 mph). I 'd like to see Eastern bar tailed godwits. I thought they could only be found in NZ!! BTW the November edition of the national Geographic has a story about migratory animals. Various other species and their seasonal arrival dates in breeding grounds I believe are influenced by the condition of Arctic Ice (THE CLIMATE). The birds & bees can tell us a lot. All right, in response to Kevin, I'll reluctantly de-lurk (thanks, btw, for the very informative discussion of iron seeding and methane release). The effects cited, including 25-50 foot sea level rise, are by the end of Stage 2. They follow from a worst-case time frame for Stage 1 (2010-2050), which takes the highest projection of temps by 2050 and 2090 (A1F1 scenario worst case as revised recently by MIT, iirc) and changes the recent sea level rise projection adjustment, which is 6 feet by 2090 (7 feet along the US eastern seaboard), and which is mostly due to increased projections of Greenland land ice melt. The reason I raised that projection is that present projections assume that Greenland melt will remain constant at its present level, despite the fact that it has doubled roughly each decade over the last 3 decades. I therefore assume that it will double in rate over the next four decades as well, yielding 15-25 feet sea level rise by 2090 (if it levels off after that) or as much as 50 if it doesn't level off and west antarctica continues to increase in melt rate. A paper cited in www.climateprogress.com has suggested a mechanism for at least one more doubling due to sea-floor melting of glacier ice "greasing the skids" of Greenland glacier flow, and the extension of ice-free boundaries around the whole of Greenland and from sept. to year-round by 2045, as we've discussed here, provides a mechanism for another doubling. The major wild card, in my view, is the effect of likely increases in snow on the Greenland plateau. So what I didn't say, in order to leave myself wiggle room, is that at the present stage of our knowledge it is still plausible that we reach the end of Stage 2 and the beginning of Stage 3 by 2090. After that, the effects become much more conjectural, since it's hard to predict when the west Antarctic land ice sheet will collapse (which, as I understand it, means breaking off and sliding into the ocean en masse). Peter Ward seemed to think it would occur between 2500 and 3000, but he was also conservative about when the Arctic would become effectively ice-free in summer and year-round. Sea Level rise is about 3.2 mm/year and has been fairly linear since 1993. Would like to caution everybody against making speculations of acceleration with minimal data or models. Thanks for clarifying, Wayne. Sure hope you are not correct. . . I'll quickly add that it's interesting to see the freeze-up continue to be rather slow, especially in the Southern reaches of the Arctic. The current IJIS extent is almost at the record-low levels seen in 2006. So what about Hudson Bay? I noticed a few days ago on the CT comparison page that it was not like that a decade or two ago. Wayne Davidson also mentions it in his latest update. Thanks for the link, Neven--interesting discussion. It does take me back to growing up in Sault Ste. Marie, where you could pretty much feel the difference in winters where Lake Superior froze completely-colder, drier, less snow. I was just a kid, of course, but it was common wisdom, and sure seemed accurate to me at the time--and does seem to make physical sense. A similar effect for the much larger Hudson Bay seems plausible to me--FWIW! Very slow to freeze up this year. Should be almost half frozen by now, but it's only about 10%. I found this very interesting article on "Reporting climate science" which attributes the current cold weather over Northern Europe to the low level of sea ice in the barents and the Kara sea. Low level of sea ice ? I am not so sure: Here are the CT reports for the Barents and the Kara . The SIA in the Barents is about 3 times as big as it was this time last year. On the other side of the arctic, SIA in the Chukchi and Hudson Bay ( as noted by Andew) is much lower. May be these people are using other data? Combined (95-07) model / data linear volume trend of -1075 km3/yr -> zero by 2016 or so. No reason is given for dismissing Maslowski or other previous work. Zhang et al. just want to see how their approach works out. sensitive to CV [climate variability] ." You can't have one without without the other (extent/volume) and worse for Zhang et al. "warming" does not only increase temperature, it also increases variability, so you can't have the first without the second. So I'm not ready to pick Zhang over Maslowski. We have three more years of volume data to add to Maslowski's data and make a new linear projection. The regulars here surely have these data on the tip of your tongues, or at least a link. What are the numbers? And how soon do you think a summer breeze is going to blow Zhang et al. out of the water? Hi Pete. I've enjoyed your comments on Real Climate, Skeptical Science, and Climate Progress. Welcome to the Arctic Sea Ice blog! I too have some questions on the Zhang et al. (Oct 2010) paper. I think most controversial is the focus on atmospheric forcings for sea ice loss. Maslowski does the opposite, focusing on high res. ocean modeling to explain sea ice loss. Since the latent heat of sea water is approx. 800x more than air, sea currents would seem to be a more important forcing. 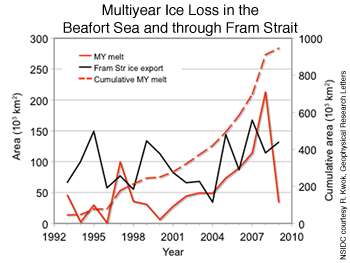 I don't think either approach accounts for sea ice loss due to advection thru Fram and Nares straights. This is the likely end game once the Central Basin pack is sufficiently broken. Additionally, Zhang et al. cites only 13 other papers, and introduces a new argument in the last sentence of the conclusion. Both are signs of a rushed paper. Compare Years at - Freeze - Up Dates of Chukchi Sea, part 1.
based on volume data between 1995 to 2007 which he claims shows a trend loss of 1075 Km^3/year. closer to 1000 km^3/year over the last 5 years. suspect that we are within 4 years of a sea ice free arctic. on a 2 dimensional chart the rate of loss is not as dramatic. while in 2007 and 2010 it was nearly 3 Mkm^2. This implies an average yearly loss rate between 8000 to 9200 km^2/year. That points to an ice fee arctic between 2040 to 2050. So, the projection depends on how one models the problem; 2D or 3D. More sophisticated models are beyond my ability. Does anybody have a link to the Zhang paper? Dodger (does anyone call you by your "first" name?) thanks. Andrew, doesn't volume win? If the ice keeps getting thinner due to a nearly constant loss of volume, thickness goes to zero taking extent with it. More dark Arctic water is exposed to the sun earlier in the summer than used to occur, along with other warming effects. Is there a reason why sufficient heat to reduce volume by around 1000 km^3 per year or even 700 km^3 will not be delivered to the remaining ice each summer? Hi Pete. Please, call me 'Lodger'. And yes, you've provided an excellent precis of 'Arctic Amplification'. This is a topic I'm working on for a new post, hopefully be out by Christmas. This is a topic I'm working on for a new post, hopefully be out by Christmas. Please keep us updated on that, Lodger--I'm sure many will want to read that. Thanks very much for the Zhang paper. Yes; I tend to suspect that volume will win out. at a very low level. He also seems concerned about sea ice recovering. So, maybe we will have an ice free arctic 1 year, but not the following. However, it's odd that he also defines an ice free arctic as 10^12 m^2. should hit that by 2030. I'll study his paper some more, but so far I'm still in the 2016 (2014-2019) camp for the initial year of an ice free arctic (<1 Mkm^2). >" Is there a reason why sufficient heat to reduce volume by around 1000 km^3 per year or even 700 km^3 will not be delivered to the remaining ice each summer? " As the Zang paper says "a thinner ice cover increases winter ice growth". So we should expect increases in volume melted over melting season as larger areas become ice free earlier affecting albedo. However, we should also expect increases in volume of water freezing as the ice gets thinner in the winter making less insulation so more heat is lost allowing more water to freeze. If the growth in water freezing is more rapid than growth in melting then it might be a long time before ice freeconditions. However, this seems unlikely to me given the apparent downward acceleration in rate of change of volume and extent (or is that variability rather than trend?). Also if the difference between melting and freezing is as large as it appears to have been over the last 3 or 4 years, the numbers I played about with seemed to indicate an implausibly large growth in volume freezing was needed to prevent a summer ice free state occuring quickly. However, I not sure a) we can be sure last 3 or 4 years ice loss are as large as they appear nor b) that this is typical rather than decadal variability. Also c), I am sure other people would have a much better handle on the increase in the heat loss over the freezing season as the ice get thinner and the ocean & atmospheric heat transport in. Cryostat 2 data for last few years would be very useful for this sort of 1st order heat budget estimates. But somebody must surely have done a much better job of this than my playing with a few numbers. >"We have three more years of volume data to add to Maslowski's data and make a new linear projection. The regulars here surely have these data on the tip of your tongues, or at least a link." >"Figure 1e doesn't make much sense to me "
Surely the Zang paper cannot be doing what it sounds like to me. "Starting with a SAT drop in 2010, because the randomly picked years from the two pools are all colder than 2009"
The SAT for A1 and B1 fall by 2C in 2010. Is this because the SAT has been reduced to the level of a randomly picked year in 1948-2009? If so, this would presumably be a major reason for the ice volume to shoot up in the A1 and B1 scenarios and also for a considerable delay before summer ice free conditions to be reached. A very odd way of doing a projection? NSIDC's November analysis is out. Too bad they didn't include this year's numbers and/or the transport data for Nares and the Canadian Archipelago. Joe Romm has a good blog post out. I think he's doing really well wrt reporting on Arctic sea ice. It has only just been listed so there aren't many book orders there yet. Only one to buy 30 contracts at 20. So you would have to be more than 80% sure that there is going to be a new JAXA record low extent before this could look like a good gamble. No-one is betting there will be a record - but maybe more and more interesting book orders will follow. >Surely the Zang paper cannot be doing what it sounds like to me. >"Starting with a SAT drop in 2010, because the randomly picked years from the two pools are all colder than 2009"
As far as I can tell they are indeed doing what it sounds like. They randomly pick a year from either 1948-2009 or 1989-2009 as the base, and then only superpose the 2 or 4 degree C trend starting in 2010 and going forward. If there were a past linear trend in actic SAT, their initialization would thus subtract all arctic warming over either the last 30 or 10 years ... but really it's really worse, since the arctic SAT trend has been faster than linear. >The SAT for A1 and B1 fall by 2C in 2010. Is this because the SAT has been reduced to the level of a randomly picked year in 1948-2009? Again, that seems exactly right. A2 and B2 should also fall in 2010 but by a smaller amount as the randomly picked years are 1989-2009. I'm interested and frankly a little bit amazed that, updating things a bit, someone out there think the odds of a new record low in JAXA extent next year are higher than 75% - so far the contract has traded at 50 and at 25. Phil mentioned "very cold": Alert, the northernmost station in Canada (and home for Wayne Davidson, IIRC) is currently at -33C. Chilly enough for me. Kevin: Thanks for the link. I thought Wayne Davidson was based at Resolute (nice resort too with a current temperature of -36C). I think the worst about these tow places is NO sunrise and NO visisble light. Alert does not even have nautical twilight! Now if you wanted a more sensible projection what would you do? I am thinking: Take average of 2006-2009 temperatures. Then if randomly picked year was 1957 then temperatures to apply in first year of projection would be calculated as 2006-2009 average + 1958 temp - 1957 temp. Even if that is not ideal wouldn't there be something like that which would be much more sensible for a projection than what was done? And why didn't Zang et al do something more sensible? GasGlo: So can you see now that Zhang et.al (2010) is the last nail in the coffin of 'the recovery'? Even if atmospheric temps were to return to those present in the 1950's, the Arctic will still be seasonally sea-ice free by the 2030's, and routinely so by the 2050's. >"GasGlo: So can you see now that Zhang et.al (2010) is the last nail in the coffin of 'the recovery'?" Have I given the impression of supporting a recovery of arctic sea ice? I didn't intend to. Perhaps I meant and did express some scepticism of the most rapid changes being suggested but yes I am increasingly finding the more rapid suggestions to be more plausible / likely. I'm not keen on calling it the last nail in the coffin of the recovery - that has been madness for some time and I doubt this will stop madness from continuing. >"Even if atmospheric temps were to return to those present in the 1950's, the Arctic will still be seasonally sea-ice free by the 2030's, and routinely so by the 2050's." That seems more appropriate than the first three sentences of the abstract which include "if a future Arctic experiences a range of SAT fluctuation similar to the past five decades" when the very rapid reduction in SAT imposed certainly isn't similar. I wonder if anyone will feel the paper is sufficiently wrong to warrant a comment? Well, I for one found your comments to be extraordinarily useful, Gas Glo. You made me ask myself, why assume such unlikely atmospheric forcings, and completely without cause? Then it occurred to me, what they're really doing is taking the absolute 'best case for recovery' weather scenario conceivable, and seeing what happens. Sadly, the sea ice disappears anyway... this is what I refer to as the final nail. Thanks again for your thoughts! I always find them interesting and worthwhile. Cheers, mate! I assume others are also less obsessive about looking at extent figures than during the melt season but, in case it's of interest, I just thought to check on them and as of yesterday 2010 is the lowest for that date in the JAXA extent record once again. BTW, I'm signing in from Google now because there's no button to click on if I select Facebook from the menu on the Typepad sign in page. Does anyone know why that is? Not really a problem unless I decide I really need the picture beside my posts but perhaps it's more of an inconvenience for others. Well, it's a red-letter moment: The Stoat, who unlike his potential victims above is spending the snowy Cambridge winter toning his muscles, has just said in context of prospects for a 2011 record low that the current state of the ice is "interesting." Gasp. Re Zhang, I think the modeling method means one should pay no attention to one or two years, as with GCMs. Fox Basin (the Northern limb of Hudson's Bay), was up to 14 C above average in November. It is at the approx. center of the Western extreme of the +10 C temp. anomaly arc spanning 3/4 of the Arctic. You will never see a clearer image of Arctic Amplification. Notice in the SH that the Antarctic Archipelago anomaly is between 2-4 C, and WAIS is between 0.5 - 1 C. All regions of Antarctica that where below normal in Nov 2010 are areas where Sea Ice melts out completely each Summer. So we're losing land Ice in the Western Antarctic, and Sea Ice remains variable. 14C, over the span of a month? I have read elsewhere that all radio collared bears near Churchill, Manitoba were still on shore as of Dec 1. With the Sea Ice coming off Hudson Bay around July 1st, 2010 Bears had nearly 60 fewer days for the seal hunt. It will be interesting to learn the cub mortality rate this year. Some female bears have now run out of fat reserves and have ceased nursing. Cubs, with little fat reserves of their own, can not last long without support. What's happening to Polar Bears is very sad and depressing. As a wild species, they are becoming extinct. The November surface temperature map is more interesting. Notice how the scale for warming has been shifted to 10C, but not the cooling. Only Eastern Greenland and areas downwind (Norway) are at or below average. Wonder if this could be indicative of adiabatic winds from the icecap. I'm still working on the Zhang paper and associated graphs from Washington.edu. It's just so incredible that he or any arctic sea ice researcher would ever assume that next year would ever revert back to the long term mean for surface temperatures. It distracts so much from the usefulness of his paper. You're missing the point. The A1 and B1 scenarios are the control scenarios - i.e. the ones where you assume that there is no net Arctic warming to date, and that all the recent changes in Arctic temperature are a result of random climate variability (CV). Of course, if you'd like scientists to start leaving out their negative controls when running their models, feel free to say so. You won't get anything published, though. Set against the A1/B1 controls, you have the more realistic A2 and B2 scenarios, where they estimate CV based on the 1989-2009 data alone. This gives them a warmer baseline, and a reduced estimate of the random year-to-year variability. You could perhaps argue that they should have done a third permutation, say A3 and B3, where they estimate the CV from only the last 5-10 years of data, giving an even warmer baseline. I'm not sure why they didn't, but a logical guess is that 10 years isn't enough data points to give a statistically valid estimate of CV. The important result from that paper is that regardless of whether you assume future warming of 2 degrees (B1/B2 runs) or 4 degrees (A1/A2 runs), you end up losing all the Arctic ice in summer. This applies both under realistic assumptions of random climate variability (A2/B2 runs) and also under the most conservative control assumptions (A1/B1 runs). For me, the scariest result there is actually the B1 series. It says that you eventually lose all the Arctic summer ice if there's 2 degrees of warming from the historical baseline. We've already had that 2 degrees of warming, which to me implies the tipping point has been passed and it's now just a matter of time. They'd have to do quite a lot more work to formally show that though, which is presumably why they didn't raise that point in the discussion. I'd actually be interested to see a second set of negative controls. As things stand, it's possible that the model itself is unstable and will tend to lose ice irrespective of the values you choose for future warming and random CV. Running a third set of runs (C1/C2) with zero degrees of assumed future warming would eliminate this possibility. That of course is an unrealistic assumption based on what we know of the climate, but it would help show that there's no intrinsic problem with the model they're using. However, if they did run the model for the zero-warming scenario, presumably some pinhead would spin it as "Top Climate Scientist Warming Has Stopped". Thanks Peter Ellis; I can understand how these A1/B1 scenarios made sense 15 years ago. However, for anybody to make such assumptions now (and in the future) will only result in anomalies that are at best a distraction. As the amount of warming and melting becomes increasingly obvious, ignoring it will serve no useful purpose. Considering how much sea ice volume has deviated from any of the established norms and trend lines, it'd make more sense to weigh the most recent data heavier than older data. The specifics of how to do that are up to the motivated researcher. A good model should produce results that are consistent with observations no matter what year it is initialized. Obviously, there will be variability. From the APL volume data, the standard deviation looks to be on the order of several 1000km^3. Peter, thanks for the explanation of A1 and B1 as control runs. I don't want to suggest doing away with control runs (and also suspect no-one else does). If the abstract simply said "Summer ice volume may be more sensitive to warming while summer ice extent more sensitive to climate variability." and did not spill over into what may or may not happen by 2050 then I would have much less of a problem with what has been done. There might still be a discussion of whether the control runs starting at the same temperatures (assuming this could be done reasonably) would be better controls for the purpose of concluding what the above sentence says. My inclination would be favour starting at the same temperatures because it is messy trying to compare A1 and A2 shifting the time period by about 16 years so you are comparing at like temperatures. B1 and B2 cannot be compared in that way because they are never at the same temperature. However, perhaps it cannot be done reasonably or there are some better reasons for having the control runs as they are. Para 13 says "because the September ice extent of A1 is generally above 3.0 × 1012 m2 over the whole 2010–2050 period, there is a likelihood that, with DSAT = 4°C, the Arctic Ocean would not be ice free by summer 2050". This cannot be talking about the model summer 2050 as we know what that does. It is talking about the real summer 2050 and you cannot reasonably conclude that without at least pointing out the massive 2C cooling in the model 2010 making the real world conclusion considerably less certain. That gets repeated in the abstract again without mentioning the massive 2C cooling. This sort of spill over into real world conclusions without appropriate caveats seems clearly wrong. The most appropriate control runs may be debateable. >"The important result from that paper is...you...los[e] all the Arctic ice in summer...under the most conservative control assumptions". Actually what I see is that under B1 not much is lost even by 2050 but then the temperatures never get up to current levels. See how I am having to keep going back and adjust for temperatures to see whether the conclusion really makes sense and hence why I would prefer control runs that start at the same temperature. Peter, excellent discussion of proper experimental design and model validation. I agree that scenario A1/B1 runs were performed as Controls, not to suggest the most likely future evolution of Arctic Sea Ice. This is solid work, and meets the highest standards. If you have further questions, you might consider asking them here as one of the paper's Authors posts here as Iceman. The Arctic Dipole Anomaly (DA) has reformed with a High centered near Kane Basin, and a deep Low near Svalbard. PIPS 2.0 predicts 60 km Sea Ice displacement today offshore of Nord in the Fram Strait. Hi Lodger. Thanks for bringing this to our attention. If prolonged , how is this ice displacement going to affect melting next season? Hi Phil. The main effect of sea ice advection is to remove multiyear ice from the Arctic, which in Winter is replaced by new sea ice. This new ice is much more vulnerable to loss the following Summer, since it's melting point is about -1.6 C, while multiyear ice must be warmed to 0 C before it begins melting. Seasonal sea ice is by nature transient because of it's high salinity. However the reduction in the proportion of Multi-year sea ice in the Arctic is an early indicator of Climate Change. When MY sea ice = 0, we have a seasonally ice free Arctic. Most numerical sea ice models indicate that a seasonally sea ice free Arctic is unstable (not an equilibrium state). In a further warmed Climate as under BAU emissions (or sudden methane feedbacks), it could be only 10-15 years from the first sea ice free Summer to the first sea ice free Winter. The Arctic is already out of equilibrium. However, I'm very surprised by the suggestion of only 10-15 years between the first ice free summer and first ice free Winter with BAU. Zhang in his paper (despite my misgivings) pointed out that the first ice free summer may be followed by years without ice free summers. In other words, suggesting that it could be a very long time before an sea ice free winter. I tend to believe he is correct in that regard. So, do you have papers or links to models that support only 10 -15 years? and may serve as a good model. Of course it is smaller and has limited influence/feedback. will show that it's going to be a long time before it is ice free in the winter.